Microsoft doesn't sell many variants of its Surface Book 2. There's just the 13-inch model: with a choice of Intel Core i5-7300U, or i7-8650U; then the 15-inch model, with Hobson's choice of the i7-8650U. Here in the UK your wallet will suffer great pain if you wish to choose the Microsoft Surface Book 2 (13-inch) Core i7 model over the Core i5 version. However, the Intel Core i5-7300U is a 7th gen part with just two physical cores and even this entry to Surface Book 2 computing doesn't come cheap - at £1299 (8GB RAM, 256GB SSD). If you want to upgrade to the quad-core i7-8650U model which includes an Nvidia GeForce GTX 1050 (2GB) with the same spec elsewhere (8GB RAM, 256GB SSD) you will have to stump up £1799 - a whole £500 more. According to WinFuture, a better deal is on the way for those considering the entry-level Surface Book 2. The site says it has seen "numerous dealers in the US, Germany and other countries," advertising a 13-inch model which comes with the Intel Core i5-8350U Kaby Lake Refresh processor in place of the Core i5-7300U. This would mean an upgrade from dual-core to quad-core. If one checks the Intel Ark for the Intel Core i5-8350U, this newer processor comes in 4C/8T configuration, with base/boost frequencies of 1.7GHz/3.6GHz. The source suggests that it could deliver a 50 per cent or greater performance uplift in some multi-core tasks. Other specs aren't changing alongside the processor upgrade, at least not at this time. WinFuture says that a model with the same base specs I compared on the UK website (13.5-inch PixelSense display, 8GB RAM, and 256GB SSD) are currently being listed at 1569 Euros in Germany, and $1499 in the USA. Comparing the new German price to the old UK one, for the processor upgrade but same RAM/Storage, we get £1350 (at today's exchange rate) vs £1299. So it looks like Microsoft isn't going to provide the Kaby Lake Refresh update for free in its entry level model, its marketers and accountants have probably agreed a £50 premium will be accepted by consumers. 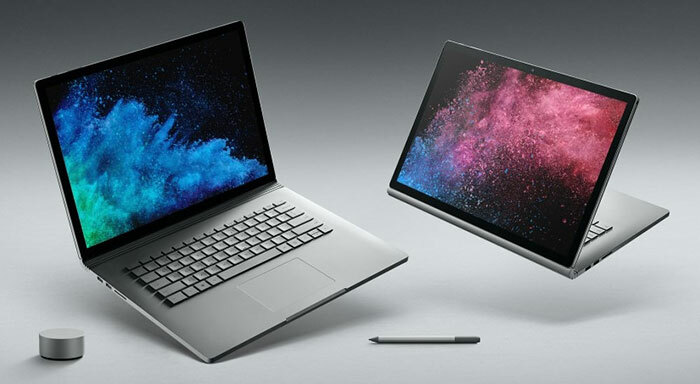 Meanwhile, in the UK it looks like Microsoft is selling off its 13-inch Microsoft Surface Book 2 models. It is taking £200 off the 13-inch i5 model with 8GB RAM, 128GB SSD to make it £949 at the time of writing. Reading around it appears to be rather tricky to upgrade the SSD inside the Surface Book 2, but the saving from buying the 128GB version is significant. To boost the storage in a tidy and economic fashion some recommend the BASEQI MicroSD Adapter which costs £20, plus the cost of your memory card. Shiny stuff is crazy expensive currently. Thinkpad X1s are listing for £1,479.99 at the moment for the base 8gb/256gb/i5.